Iron Miners Historic Mining History and Gold Mining Services • View topic - IronMiners Memorial Day Event! 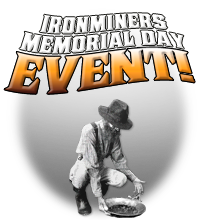 Post subject: IronMiners Memorial Day Event! I would like to personally invite everyone to our annual spring gathering, the IronMiners Memorial Day Event! This FREE event will feature gold panning, free dinner and ale, an artifact and mineral display, videos, and finally at 9pm, music and dancing! If you would like to pan for gold, be sure to arrive at 5pm -- or the gold will run out! Meet with other like-minded mine history aficionados in a friendly and relaxed atmosphere. For more event details and directions, please see our events page at http://www.ironminers.com/news/memorial-day-event/ . Hope to see you there! Post subject: Re: IronMiners Memorial Day Event! Event photos can be viewed at viewtopic.php?f=15&t=22129. No one should miss IronMiners Memorial Day Event. Worth celebrating every year.